Recent research on the economic impact of the co-operative sector in Canada show that its activity contributes over $50 Billion dollars to the Canadian economy and supports over 600,000 jobs. Researchers George Karaphillis, Alicia Lake, and Fiona Duguid from the Measuring the Co-operative Difference Research Network (MCDRN) conducted economic impact analyses on the co-operative sector for the years 2009 and 2010. The results showed that co-operatives, credit unions, and co-operative insurance enterprises had a direct economic impact (GDP) of $22 Billion in 2010 – and, through indirect and induced spin-offs, this impact multiplies to over $54 Billion. This represented 3.4% of the total economic activity in Canada in 2010. Further, nearly 270,000 full-time jobs were created in the sector and through spin-off effects, this activity supported over 614,000 jobs in many sectors throughout the country. Co-operatives between 2009 and 2010 also created jobs at nearly five times the rate of the broader economy. The study was conducted based on the latest data available from Industry Canada’s annual co-operative survey, data on financial co-operatives via Statistics Canada, and the annual reports of the six main co‑operative insurance companies. A summary of the study is available on the project’s website and the papers are expected to be published in academic journals in the winter of 2015. CMC is currently lobbying for Federal Government participation in a National Co-op Development Strategy that would substantially increase the economic impacts reported in the study. The co-operative sector is also investing in a capital fund that will make appropriate financing accessible to co-ops, a key solution to capitalizing new co-ops and expanding established ones. About MCDRN: The Measuring the Co-operative Difference Research Network is a five-year Community -University Research Alliance (CURA), supported by the Social Sciences and Humanities Research Council of Canada. The MCDRN research alliance ends in 2015. About CMC: Co-operatives and Mutuals Canada is the national, bilingual association for co-operatives and mutuals in Canada. CMC's members come from many sectors of the economy, including finance, insurance, agri-food and supply, wholesale and retail, housing, health sector, forestry resources, education, funeral services, public utilities and community development. 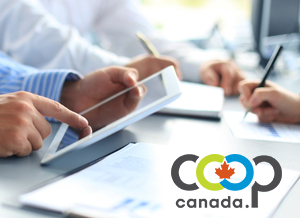 CMC provides leadership to support, promote, and develop the co-operative economy in Canada.